Getting There: Park on the side of Maddaugh Road. Not a lot of room, but there's not much traffic through here. Obscurity Rating: 4/5 - I'd never heard of it before -- and I thought I knew these things. No obvious signs unless you drive past there. A trailer community exists along part of the trail so residents are likely the most common users of the trail. 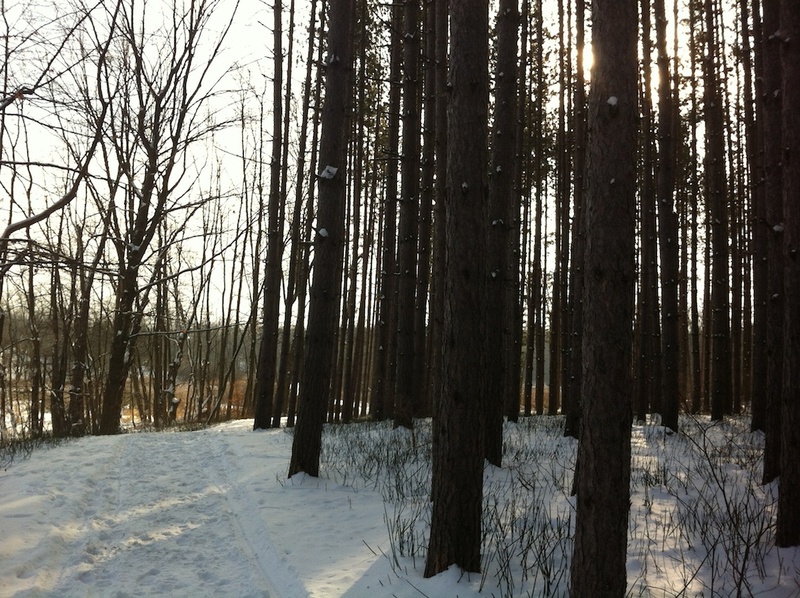 The Lafarge 2000 trail was opened a long time back, over ten years ago now. 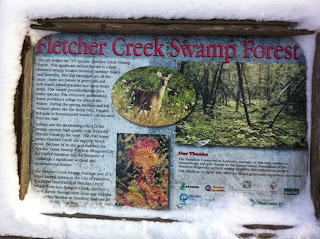 While I'd heard of (and travelled) the Defasco 2000 Trail in the Niagara region, the Lafarge trail was news to me! I had read about it online the night before, decided to take a trek out that way. 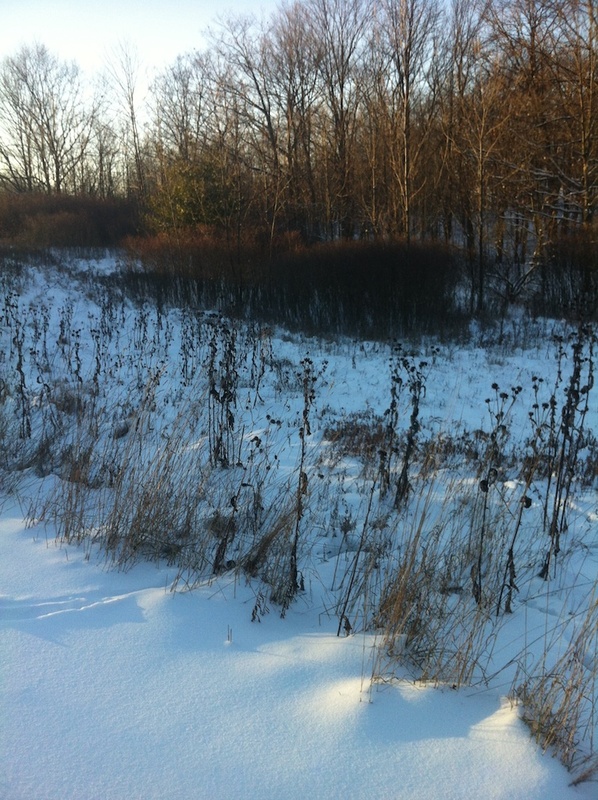 While at the extreme edge, this trail is techically in Hamilton, right on the Flamborough/Puslinch town line. In the past this trail could have been a road, though it seems unlikely that it was ever a full through road. The trail follows the road allowance where Middletown Road should pass right though, but due to a significantly boggy area on the north it seems construction on this road was deemed too much work for a road with no attached farms. Last year Dilia and I had taken a few hikes along former roadways and road allowances -- they aren't always officially turned into hiking trails like this one was. I usually refer to these as "ghost roads", and there's actually significant number of them within Hamilton's borders -- both rurally and in urban areas. 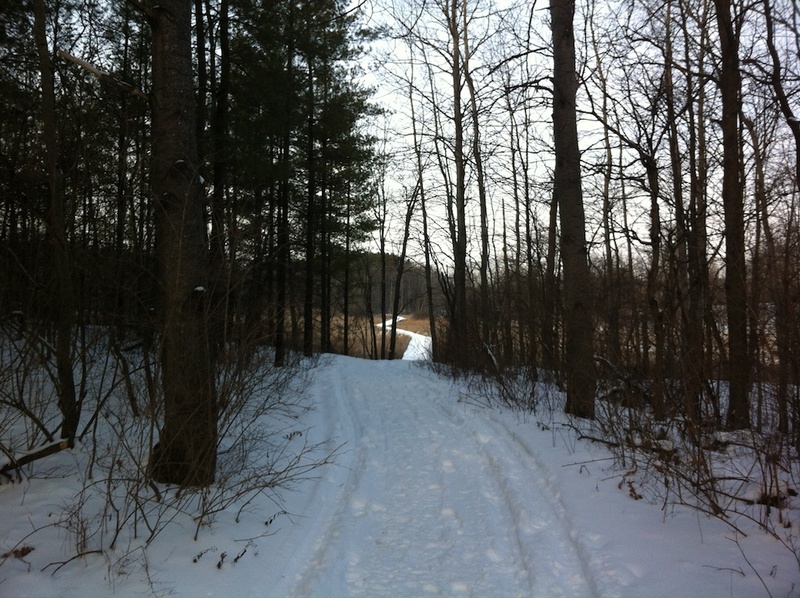 Apparently this trail continues all the way to the Hamilton-Brantford Rail trail, although in a sort-of cheating way. About 2/3rds of the "trail" is really just Middletown Road, just a third or less is hiking trail that is signed and closed off from motorized traffic. Nonetheless, it's a nice find. I'll be back later to visit the other segments! Location: Thornapple Loop Trail @ the Royal Botanical Gardens "Berry Tract"
Species of Note: Two sightings of the extremely rare Hamilton Snowshoer. 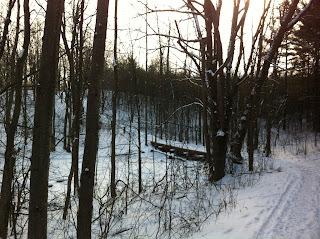 (Can't remember the last time there was enough snow in Hamilton to snowshoe!) Also, the largest flock of Canadian Geese I'd ever seen. Obscurity Rating: 4/5 - A fully signed and officially maintained trail, but no parking lot or signs to the tract make for running into a fellow hiker somewhat uncommon. It was not on Google Maps until I added it. 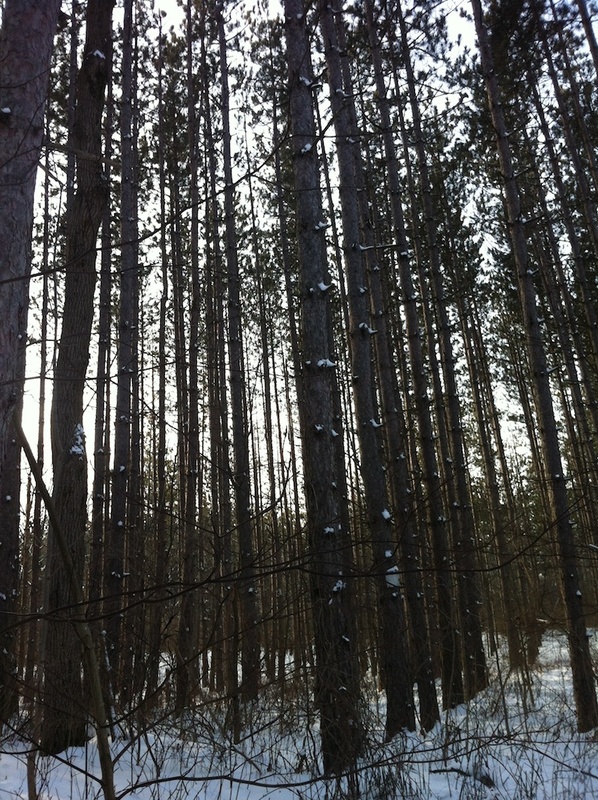 On this day I decided to go for a full walk for the second time of Thornapple Loop in the RGB's Berry Tract. 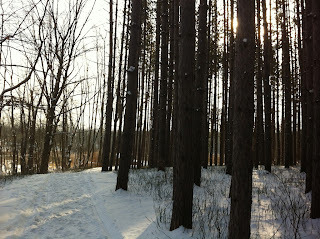 This trail takes about 25-40 minutes depending on your pace and the weather conditions. This trail is one to avoid at wetter times of the year, as it often gets pretty soggy in places that do not have plank boardwalks. 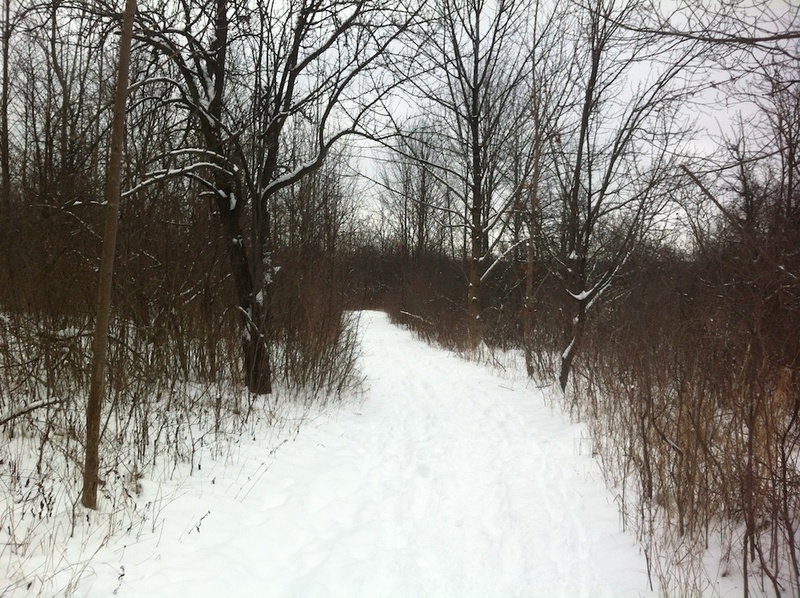 While there wasn't much bird species or anything else on the ground other than two snowshoers passing by me (snowshoes in Hamilton don't get used locally much anymore! ), there was about twenty minutes of flocks of Canadian Geese (plus Mallards) flying overhead from the north towards the Dejardins Canal and West Pond. There were so many flying over, you could actually hear a wooshing rumble of wing-beats underneath the sound of constant honking! After walking this trail and remembering about my account on Google Mapmaker, I actually came back a couple weeks later to walk the trail with a GPS tracker on, then used the data to build the trail on Google Maps. 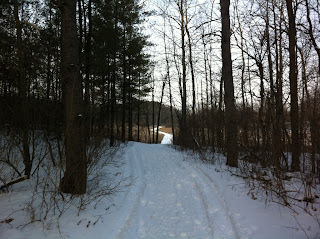 As of writing, this trail is officially published on Google Maps. But at the time I was hiking this place in December, there was nothing at all on the map, not even a reference to the conservation land. So there's a small gap of one day here apparently. It's about a month later now and I'm putting together this blog from records and memories that haven't faded yet. The 28th of December is not too clear in my head, and are complete blanks in my Foursquare and GPS app logs! By this point I certainly hadn't thought much of doing daily hikes, even during the work week, and I was still recovering from some sort of illness. The previous day's experience of seeing some new trails with some new sights did likely get me thinking about what other trails I may have missed in the last few years of hiking and cycling. So it's not like I missed my goal a couple days in -- I just hadn't thought of it yet! Species of Note: Lots of seabirds! Long-tailed Ducks, unexpected winter sighting of a Turkey Vulture. 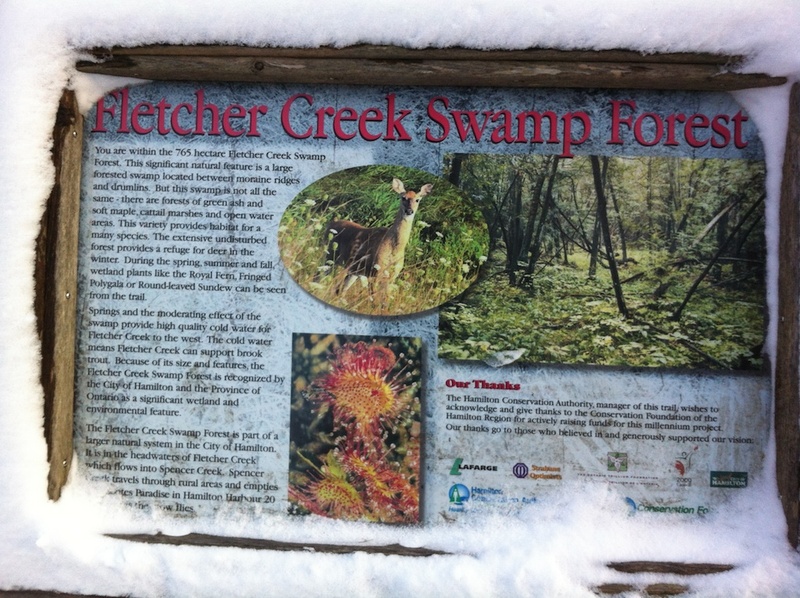 Obscurity Rating: 0/5 - A very popular trail! 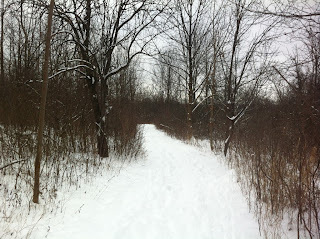 Today we took off for an urban hike along the very easy, flat, paved trail known as the Hamilton Beach Trail along. Dilia and I had decided to come here after spending some time looking up where to find some new birds to see, and discovered that this whole area of Hamilton we have not spent much time in that is a haven for rare and migrating water birds, and a few owls have been seen around the area, historically. 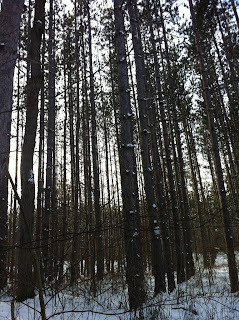 We're always looking for owls. Now that I've started to more seriously use eBird, a tool for recording observations of bird species, I'm able to keep track of what species I have and have not seen. After some fiddling with the iBird (birding field guide app for iOS/Android), I was able to identify a fairly common duck to Hamilton's shores I had like never seen before, the Long-tailed Duck. They're a migratory duck, and from the map indicators on iBird and Cornell's Bird Guide I'm going to assume Hamilton is a popular stop-over during their winter migration. Looking up at some point during our walk I spotted what should be quite a rare winter sighting: a Turkey Vulture gliding by, very high up. These buzzards are not rare at all in Hamilton, during any other time of the year. Either this bird was just following the shoreline or escarpment south a bit late, or had decided to take a risk and overwinter in Hamilton. As this post is written about a month later after the January cold-snap, I'd venture to say the second option would have been a very bad idea. 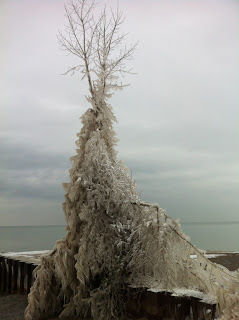 Also seen on this walk, some pretty crazy ice build-up on the shoreline trees. See the pictures below! 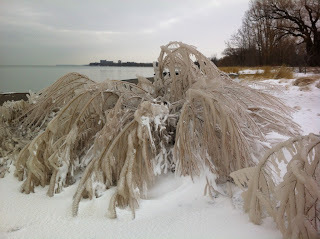 Species of Note: None today! Obscurity Rating: 3/5 - Often one or two vehicles parked here, you'll likely meet one or two groups out for a walk. 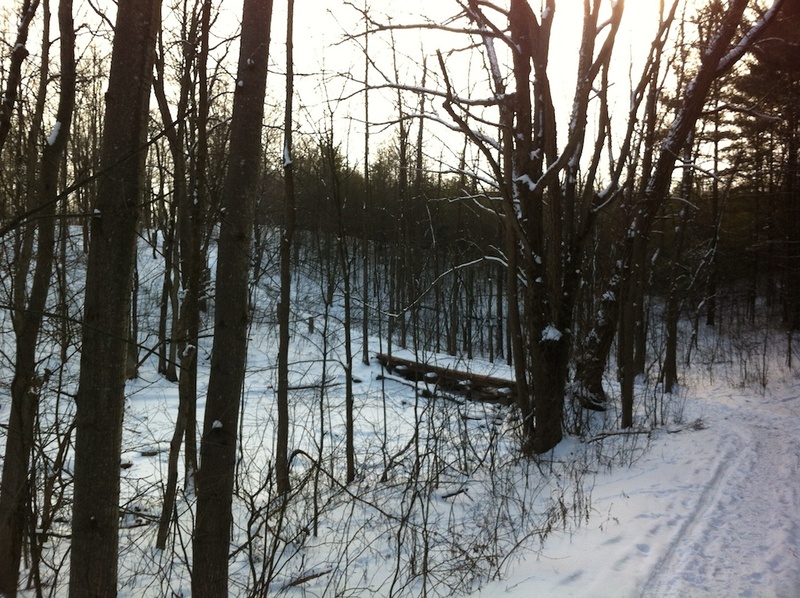 On December 27, I kicked-off this not-yet-daily habit with a short walk at the Dundas Valley Conservation Area on the Monarch Trail just off of Old Ancaster Road. 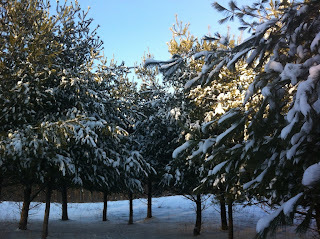 Today's walk was short -- roughly 20 minutes or so and there's not much to say about it other than it was nice and snowy! 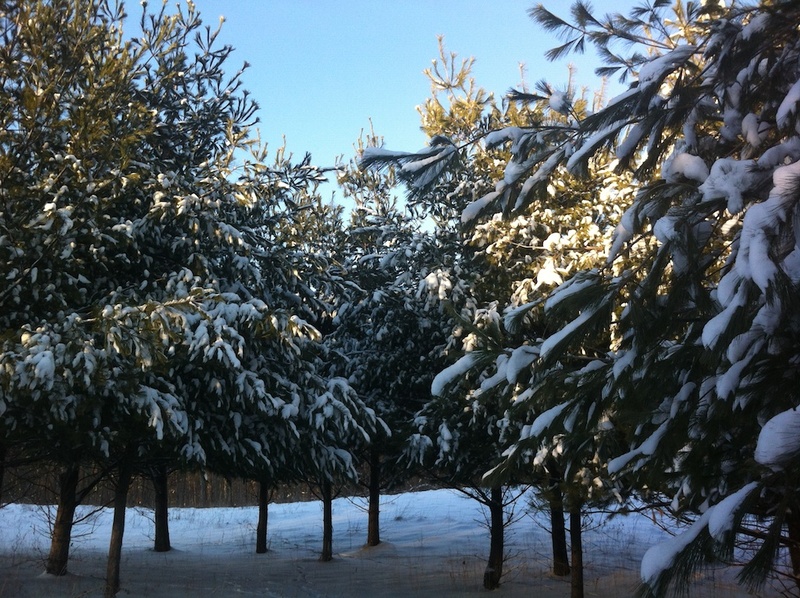 After several years of snow-free Decembers, it was nice to see a fair amount of snow on the ground. On this day I didn't have any idea that I'd start setting a goal to do this daily at any point, it was just something I felt I needed to do after so many days of not feeling well over the holidays, and after having been sick twice in the last two months. It's not often I get sick -- cold or flu, maybe once a year at most. The last cold I got I think was some time in 2010, perhaps 2009. I'm of course writing this in retrospect, about a month later from logs via iPhone apps I've used to keep track of my time out hiking. In this case, this counts as my first day in a (as of writing) 28 day streak of hiking trail check-ins on Foursquare. On this hike there were no birds or other animals of note, and I didn't record a GPS track of the walk like I do in later walks. To be clear though, hiking around Hamilton isn't a new thing for me. I'd usually go out at least once a week, and going back some years I did used to often hit a lot of local mountain biking and multi-use trails on my bike. What I'm hoping to get out of this is a bit more time out of the house and office, a greater understanding of the ecology of the region, and something new to talk about.